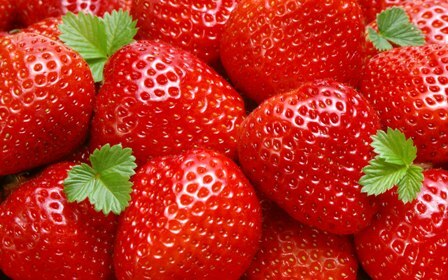 STRAWBERRY is an attractive, luscious, tasty and nutritious fruit with a distinct and pleasant aroma, and delicate floavour. It has a unique place among cultivated berry fruits. Rich in vitamin C and iron, it is mainly consumed as fresh. Jam and syrup are also prepared from strawberry. It is cultivated in topical and sub tropical areas round the year. In India, it is cultivated on commercial scale in Himachal Pradesh, Uttar Pradesh, Maharashtra, West Bengal, Nilgiri hills, Delhi, Haryana, Punjab and Rajasthan. Owing to wide climatic and soil adaptation and high returns, it has tremendous potential in India. Its cultivation can be extended to other suitable areas having assured irrigation and transport facilities. Strawberry grows well under temperate climate. Some cultivars are grown in subtropical climate also. Daylight period of 12 hr or less and moderate temperatures are important for flower-bud formation. Each cultivar may have a different day length and temperature requirement. Some cultivars are adapted to septentrional culture (short days in autumn and hard winter) or to meridional conditions (long days in autumn and moderate winter). Strawberry Senga Sengana, Redgaunlet and Gorella are grown under septentrional conditions, while Tioga is an important cultivar of meridional region. It can make flower buds under longer day length. Besides, there are several day neutral strawberries—Sivla, Fern, Muir, Heckar, Tristar and Trileute—that have made their cultivation possible in different times of the year. Day-neutral strawberries are high yielder. Temperature plays a critical fore in the development of strawberry at a particular place. The strawberry can be grown on any type of soil—poor sand to heavy clay—provided proper moisture, organic matter and drainage is present. Strawberry ripens somewhat earlier on sandy soil than on clay soil. There is definite cultivar adaptation to soils. Some grow better on heavier soils and others on light soils. Water should not stagnate in the field. Since most of its roots are found in the top 15 cm soil, keep this layer porous and rich in humus. Strawberry is not much sensitive to soil reaction. However, it prefers a slight acidic soil. At higher pH, there is less root growth. There should be no underlying lime layer up to 15-20 cm, otherwise it causes burning of leaves. In drier areas, alkali soils must be avoided, thus, sandy loam to loamy soil with pH 5.7-6.5 is ideal for strawberry cultivation. Fruit is of exceptionally high dessert quality with outstanding color and flavour. It is very resistant to physical damages caused by rain. Plants are tolerant to viruses. Fruits are large, flesh and skin firm and flavour excellent. It is suitable for fresh market and processing. On an average, berry weights 15-18 g. The fruits have good TSS (12%), acidity (0.85%), vitamin C (55.5mg/100g) and sugar content (6.1%). An early –maturing cultivar, it is tolerant to viruses. Fruits very large, flesh and skin firm, dessert and processing quality good, TSS 12.2%, acidity 0.98% and sugar 6.2%. Average berry weights about 9g. Tolerant to viruses, it produces numerous runners. Fruits large, flesh and skin medium firm, dessert quality excellent, processing quality good, TSS 12.0%, acidity 0.97% and sugars 6.1%. Average berry weights 6.9g. A day-neutral cultivar, it has the capacity to produce off-season fruits. It is different from day-neutral or ever bearing types. Fruits large, flesh and skin firm, conic to blocky in shape, dessert quality good. It can be handled and shipped fairly well. Skin bright red, attractive, flesh red, internally somewhat hollow, light in color at core, average berry weighs 15-18g, TSS 11.1%, acidity 1.0% and sugar 5.5%. Fruits large, conical (necked fruit), skin bright red, flesh attractive red, somewhat firm, less hollow at core, high quality, sweet, slightly subacid, average berry weight 15 g, TSS 11.8%, acidity 0.98%, sugars 6%. Plant produces adequate runners. It is a day-neutral, early-ripening and over-bearing cultivar. Fruits large, medium, conical, solid internally, slightly hollow, skin red, flesh red, firm, flavour excellent, suitable for fresh market and processing. It tastes sweet to slightly sub acid. Average berry weight 20-25g, TSS 11.2%, acidity 0.98% and sugars 6.1%. It is very successful under summer system. Plant tolerant to virus. Fruit has good dessert and processing quality. Fruit is quite susceptible to physical damage caused by rain. Fruits large flesh very firm, skin firm, red color, average berry weighs 7.6g, TSS 12.2%, acidity 0.97% and sugars 5.5%. Besides, Premier, Red Coat, Local, Jeolikot, Dilpasand, Bangalore, Florida 90, Katrain Sweet, Pusa Early Dwarf and Blakemore are also grown. Strawberry is commercially propagated by runners. Generally one plant produces 7-10 runners but under proper management, it can go up to 15 runners/plant. It can also be propagated through crowns (3-5 plants/crown), but division of crowns of older plants is too tedious and expensive for cultivars producing runner plants readily. Runner formation can be stimulated with the application of IBA (100 ppm) 10 days before flowering, and also with Morphectin (50ppm). Propagation by seed is not suitable as the seedlings do not come true-to type. Due to this, old strawberry buds may have many untrue seedlings undesirable for propagation. Where viruses and nematodes are present, primarily in commercial plantation, the growth and production of plants may be reduced by half or more. It is desirable to procure virus-free plants for commercial plantations. In addition, these plants are raised in fumigated soils to control nematodes. Planting virus and nematode-free stock, and keeping it clean provides protection against serious diseases. For large scale propagation of virus-free plants, tissue culture is widely used. Under favourable conditions, one strawberry meristem can be multiplied to yield more than one million plants in a year. Plants can be regenerated from meristematic callus, anthers and immature embryos. Soil preparation is very important for strawberry cultivation. It should start during summer when the soil is ploughed with a soil turning plough so that the insects present in soil may die. It should be followed by repeated ploughings to make soil friable. Remove weeks and stubbles. Since most of its roots are confined in top 40 cm soil, the soil should be made friable. Deep cultivation improves water absorption by the crop. The weeds can also be controlled by applying paraquat. Soil should be fumigated before planting to control fungal diseases, particularly verticillium wilt. Soil fumigation with a mixture of methyl bromide and chloropicrin helps increase foot system, reduces N fertilizer requirement and control several weeds. September-October is ideal of planting runners or crowns in hilly areas. The planting material should be healthy, disease and insect-free. Early formed, well-developed runners are ideal for planting. Fruit buds are established during the fall of the first season. The September-October planted plants are well-established in the field and start giving quality fruits in spring season. If the planting is done too early, plants lack vigour and result in low yield and quality of fruits. If planted very late, runners develop in March and crops are light. In Punjab and Haryana, planting during November is promising. If planting is done in spring, use only healthy and vigorous plants. The larger the plants at the end of first season, the larger will be the succeeding crop. In temperate humid regions, planting can be done in spring. If the weather is undesirable, plants can be stored in polythene bags at 31*-32*C until conditions are favourable. Cold storage plants usually grow as well as freshly dug field plants. There are 4 training systems-matted row, hill and plastic mulch. Generally matted row system is followed in our country. Matted row: This is the simplest and least expensive method. The runners are usually planted at 90 cm x 45 cm spacing. In Himachal Pradesh, a spacing of 60 cm x 25 cm for Chandler is optimum. After the initial growth of the first year, runners are allowed to cover the vacant space all around the mother plants ultimately covering the whole vacant space and giving the appearance of a mat. It is generally followed in heavy soils which are free from weeds. In this system, more number of plants can be accommodated/unit areas which give a higher yield under suitable conditions. The overcrowding may cause higher fruit rot. Thus care must be taken to maintain the optimum number of plants without overcrowding. Spaced row: This system is suitable for cultivars that are moderate to weak in producing runners. The daughter plants are spaced at definite distances by covering the selected tips of runners with soil which become plants. This is done till the desired numbers of daughter plants are obtained for each mother plant. The runners formed later on are removed. Hill system: This system is followed for the cultivars developing a few runners. All runners are removed from the mother plants. The individual plants become large and bear more than those in matted row: The plants are planted 25-30 cm apart in twin rows 20-30 cm apart and 100-110 cm spacing between twin rows. A small tractor can be used for tillage. Where cultivation is done manually, the rows can be spaced closer at 60 cm. In some cases triple rows are set. Plastic film: Green or black plastic film is used as a mulch for the hill system to control weeds and conserve moisture, but on hot hays, some scalding of berries takes place. In this system, berries are kept clean and rot and mold are reduced. The plants bloom earlier. These are prone to damage by frost. There are different recommendations for strawberry grown in different states in India. In Himachal Pradesh, application of 50 tonnes farmyard manure along with 40 kg each of p2o5 and k20/ha at the time of preparation of beds is recommended. The N (80kg) should be applied in 2 split doses; half in September or after the establishment of plants in September-October, and the remaining half before blooming. For Uttar Pradesh hills, apply farmyard manure (25-37.5 tonnes), N (75-100kg), P2O5 (80-120kg), k2O (50-80kg)/ha. The farmyard manure should be mixed in soil at the time of preparation of planting bed. Full dose of P2O5 and half of k2O are placed in the planting rows at 15-20 cm depth. Half N should be broadcast in inter-row spaces a month after planting and the remaining half N and K2O should be side dressed at the time of flowering. Foliar spraying of N (0.5%), P2O5 (0.2%) and k2O (0.5%), 4 times between August and February is also advised. The flower stems should be removed as they appear on plants after planting. If not removed, flowers create a drain on the plants, reducing their vitality, number and size of daughter plants. This practice also helps establish the plants and aids in tolerating heat and drought. The removal of flower strains from cultivars which produce small number of daughter plants increases the number of runners and plant set. In Hill system, runners should be cut as and when they appear. With matted row system, surplus plants should be removed from outside the rows during late summer or autumn. The operation can be performed normally or with the help of cultivar and other specialized machinery. Keep the crop weed-free during first season by cultivating, applying herbicides, or plastic sheet. The soil should be worked towards the plants. It should be ensured that soil remains around the crown without covering them. Cultivation should be restricted to only upper 2.54-5.08 cm of the soil. It should be continued till the straw mulch is applied (where it is used). Weeds should not be allowed to grow. Emergence of weeds during the fruiting season also affects pollination by honey bees, thereby reducing yields drastically. Irrigation is a must and in humid regions, even short droughts reduce the yield, damaging the shallow root system. Since strawberry is a shallow-rooted plant, the plants require more frequent but less amount of water in each irrigation. Irrigation of newly-planted buds results in increased runner production and early rooting. Strawberry plants produce optimum growth when the soil moisture tension is maintained at less than 1.0 atmosphere. Excessive irrigation is, however, detrimental which encourages growth of leaves and stolens at the expense of fruits and flowers and also increases the incidence of Botrytis rot. Irrigation should be applied in furrows between the rows. The alleys are usually cultivated after 2-3 days of each irrigation. Care should be taken that water should not wet the leaves and fruits as it may increase the incidence of fungal infection. To obtain better fruit size and quality, it should be irrigated judiciously during harvesting. Nowadays trickle and sprinkler irrigation systems are becoming popular. In trickle irrigation, 30% water and energy are saved. Less disruption of picking schedules, better water supply during winter and less rotting of strawberries and saving in water are added advantages. Sprinkler irrigation is, however, valuable in areas where there may be heat stress (>85*C temperature) and need for frost control using 50 ppm water. Strawberries are generally harvested when half to three-fourths of skin develops colour. For distant shipment green or white and still hard berries are harvested. Delaying in picking usually increases the proportion of overripe and rotten berries. The picking duration differs from cultivar-to-cultivar. It is 5.5, 3.5 and 32 days for Tioga; 55, 30 and 30 days for Torrey during first, second and third year respectively in Himachal Pradesh. For Harayana conditions, it is 53 days for Tioga and 43 days for Torrey. 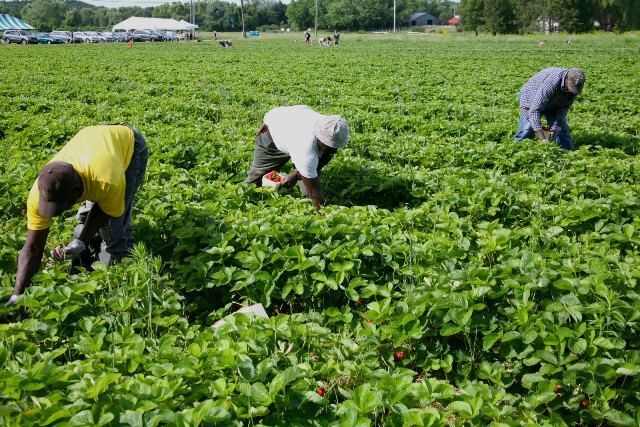 Depending upon the weather conditions, picked should be done every second or third day. Ripening is faster is hot weather. Do not leave any ripe or rotted berry in the field. Berries should be picked along with a small steam portion attached. Picking should be done in the morning. It facilitates better shelf-life. Thus a yield of 96.53, 47.52, 52.08, 47.83 and 44.24q/ha from strawberry Tioga, Torrey, Howard 17, Catskill and Blakemore respectively may be taken. However, with proper fertilizer management an average yield of 175-300q/ha may be taken. Some plant bioregulators-GA3 (50ppm) sprayed 4 days after flowering, and maleic hydrazide (0.1-0.3%) sprayed after flowering increase yield up to 31-41% Morphectin (50ppm) improves the fruit size. Strawberries are harvested in small trays or basket. They should be kept in a shady place to avoid damage due to excessive heat in the open field. For distant marketing, strawberries should be precooled at 4*C within 2hr or harvesting and kept at the same temperature. After precooligng, they are shipped in refrigerated vans. Strawberries can be stored in cold storage at 32*C up to 10 days. Afterwards they lose their fresh bright colour, showing some shriveling and deterioration in flavour. Strawberry fruit can be frozen for their processed product or as dessert. The strawberries having high flavour and a bright red colour. Olympus, Hood and Shuksan are quite suitable for ice-cream making, whereas those of Midway, Midland, Cardinal, Hood, Red chief and Beauty are ideal for processing. Albinism is a physiological disorder in strawberry due to lack of fruit colour during ripening. Fruits remain irregularly pink or even totally white and sometimes swollen. They have acid taste and become less form. Albino fruits are often damage during harvesting and are susceptible to Botrytis infection and decay during storage. It is probably caused by certain climatic conditions and extremes in nutrition. Nauni, Solan HP 173230, India.